Last year The Twilight Sad were preparing the follow-up to 2014’s incredible Nobody Wants to Be Here and Nobody Wants to Leave, the record that piqued the interest of none other than The Cure’s Robert Smith. The band augmented their line-up with long-time contributors Brendan Smith and Johnny Docherty, adding Sebastien Schultz on drums after the departure of Mark Devine. Singer James Graham became a father in May, and days later lost one of his closest friends and most important musical brethren. 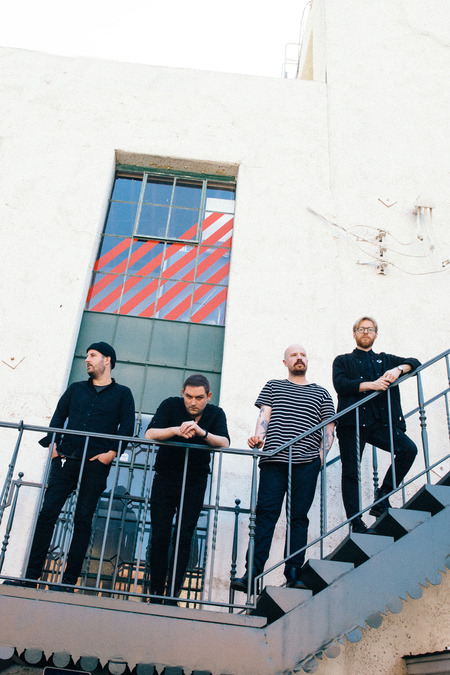 Shortly after the passing of Frightened Rabbit's Scott Hutchison, The Twilight Sad returned with a live set at Primavera Sound festival in Barcelona. It was one of the most powerful and heartbreaking performances they’ve ever given. "The crowd were amazing that day," recalls Graham. "If I’m really feeling it, if I’m struggling, the crowds have been getting us through it big time, and that’s every night, but none more so than that gig. That was a real marker point of knowing we’re not in it alone, there are people that know who we are and care about it. It was eye-opening." Graham admits to being petrified. It was the group’s first show in two years, the first with all new members in place (alongside himself and Andy MacFarlane), new songs and new equipment. But, most importantly, it was the first time they’d played Keep Yourself Warm, a Frabbit cover that has taken on so much weight – now the anthem for a communal heartbreak, a sign of hope that something carries on amidst the sadness. "That was the major worry for me, just making sure we did it proud," Graham says. "I know how I reacted and I can’t imagine that’s an easy [performance] for anybody to watch if they know me and they know Frightened Rabbit and they know what it means. The whole point was to keep singing Scott’s songs but to also show people that it’s alright to feel that way. If I can go up on a stage like that and let it out, I think it showed people that you shouldn’t be ashamed to show your emotions, to tell people, to talk. That’s the thing that I’m taking away from all of this, is that we need to be more open with each other." Over the following months, it became a staple in the set, each performance more enchanting and gut-wrenching than the last. The band toured for months in the US and Europe, to bigger and more enthusiastic crowds than ever before. Repeatedly, Graham would exorcise the still-raw pain of his loss on stage, while his young family were home in Scotland or making brief visits at points along the road. It’s little wonder he’s exhausted, as he relaxes at home in Glasgow with his wife and son for the first time in months. It’s nearly Christmas and it’s the calm before the storm of the new album coming out. The forthcoming weekend, he’s performing with Frightened Rabbit at the Glasgow leg of charity event Sleep in the Park – it’s the first time Frightened Rabbit will have played since the devastating departure of their singer and chief songwriter. "I know a little bit how it’s going to feel but it’s going to be times a million because I’ll look round and I’ll see Grant [Hutchison], Billy [Kennedy] and Andy [Monaghan]," he says. "We rehearsed Keep Yourself Warm when we were in the rehearsal studio and that was very hard but you got to a point where you were okay with it. But as soon as you get in front of people, so many more emotions overtake you. With the crowd that are going to be at that show, it’s going to be everybody in it together. It’s going to be really hard but there’s going to be pretty beautiful moments as well. "I think we’re all going to remember a lot, we’re all going to cry a lot, but we’re all going to come out of it feeling like hopefully we did him proud again. It’s horrible what’s happened and we’re all still going through it and I don’t think I’ll ever be able to get through it, and I don’t want to either, to be honest. The moments that I have been remembering a lot, I go through ups and downs with it, I just think of all the amazing times. When I listen to his music, I just remember he loved doing that and that’s a massive positive to me. Hopefully, when we go out there and we sing his songs, we think about all the amazing things that he’s done and what an amazing person he was and that’s to be celebrated." Graham is an intense live performer, increasingly injecting a striking physicality into the band’s shows. Night after night of this, while so openly dealing with grief, in a band that’s on a steady upwards trajectory; it’s little wonder that 2018 took its toll. "There’s a lot more weight to what we’re doing now," he admits. "I’m putting as much in to it as I always have but we’re playing for longer as well. Physically, it’s pretty knackering but at the same time the emotional weight of it bears quite heavy, especially the last two shows [in London and Edinburgh]. I definitely felt a bit spaced out and a wee bit worried to be honest. "After these gigs, I just felt really delighted that people liked the gig but it’s been a bit of a weight on me as well," he says, conceding he’s drained. "I’ve never been more exhausted, mentally and physically, than after these shows. It’s something that I’m definitely thinking about, and I think it’s something that everybody needs to start thinking about and talking about. Yeah, people are going out in vans and it looks as though they’re having the time of their lives – don’t get me wrong, most of the time they are – but with the way that I perform, there’s a lot of angst and worry and all that kind of stuff." While he’s most certainly ready for a rest before the album’s release and touring starts again, he’s taking many positives away from recent events. "I know what we’re doing is a good thing. Not that I’m saying we’re good, that’s up to other people, but I know that what we’re trying to achieve, and the message we’re trying to get across is a positive one, even though the music can be dark," he says. "I’ve noticed the positive aspects of getting out there and doing that and showing your emotions in front of people. It’s basically like a therapy session every night. Even just some messages that people have been sending, just even looking out in the crowd sometimes and speaking to people after it, I can tell that [our gigs are] the sort of place people can come and not feel ashamed or worried to let it all out. "It’s not what I expected being in a band to be all about, but I’ve realised there’s so much more important things than what people think being in a band is – especially with our music. I’ve realised that music can help people and it helps me, so if our gigs are a place people can come and it feels like that’s helping them in some way, then I’m happy and proud that people can feel that when they come to see us." It Won/t Be Like This All the Time is the first release for the band on Mogwai’s Rock Action label, which is going from strength to strength as it adds the cream of Scottish artists to its roster. "Putting out a record for us is a big investment [for the label] and that shows me that they believe in us, and they always have," says Graham. "Even when we weren’t on the label, [Mogwai] were taking us out on tour and telling people about our band. There’s not just a lot riding on it for me and the rest of the guys in the band, we want to do Rock Action proud as well because they’ve invested a lot. I’m not even just talking about financially, just a lot of their time and their belief in us." Someone else who has been pivotal to The Twilight Sad’s recent success is The Cure’s Robert Smith – covering one of their songs, taking them out on huge tours and shows, and being heavily involved with the new album’s songs. The band would send him demos which he’d return with a rating out of ten (never lower than a seven) and a series of notes and suggestions, as well as masses of encouragement. "Obviously when you’ve got one of the greatest songwriters of all time asking you to try stuff, it’s pretty mind-blowing," Graham recalls, adding that 95% of everything he suggested, the band acted upon. "To think ten years ago that we could have the luxury and the privilege of being able to send our songs to someone like Robert and for him to help us," he ponders. "And he helped in many other ways as well that maybe one day we’ll talk about, but he’s just constantly wanting people to hear our music and wanting us to be the best we can be and it’s unbelievable. To see somebody that doesn’t need to help us out like he does. He can just go and get on with his life and tour the world for the rest of his days but he really cares about what we do and he wants to help us. "There are so many other bands in the world that he could have picked, but he saw something in us. It’s not just that I want to do Rock Action proud, I want to do him justice as well to show that his time and everything he has done for us has not gone to waste, that it’s been worth it." It won’t be like this all the time for The Twilight Sad. Grief will ebb and flow with time and the urge to push ahead will yield its rewards. Last year they battled some of the choppiest waves, yet somehow surfaced musically renewed and structurally more robust. They seem more driven, more accomplished, and recent tours brought greater numbers of converts than ever before; crowds swelled and passions grew. This is a band on the ascendency, and it’s a beautiful and much deserved rise. "Finding out how much what we do means to people is quite overwhelming sometimes," Graham admits. "The tours themselves were quite emotionally charged, more than they’ve ever been for loads of reasons, and then when you go back out and you speak to people and they tell you about their lives, it’s a bit of a rollercoaster but it’s amazing. They obviously see that I open up and talk about stuff through my music, so maybe they see that they can talk to me. It can be quite full-on, but it’s a beautiful thing."